The village of Solomeo is perched on the Umbrian hills ten minutes outside Perugia, about a two-hour drive from Florence. This is the home of Brunello Cucinelli cashmere luxury clothing. 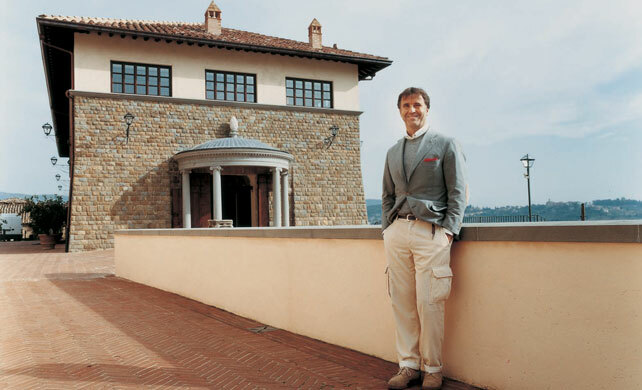 Brunello Cucinelli, the son of a rural laborer, decided to drop out of engineering school in Perugia in the mid-70s. (A few years ago, he was awarded an honorary doctorate in Philosophy and Ethics from the University of Perugia). He got a loan from his local bank to try his hand dyeing cashmere a bright rainbow of colors. Why cashmere? Cucinelli explains, “Because I never thought it would be thrown away. I wanted to manufacture something that theoretically never dies.” Other clothes may go to waste, but something made of cashmere goes from a piece of fine clothing, to every-day wear, to a favorite comfy knock-around-the-house outfit with holes or patches at the elbows. “You see the idea of guardianship; it all ties in together,” he has said. “[I]t has the fascination of eternity. You either pass it along, or find another use for it, but there is something eternal about it,” he told the men’s fashion magazine The Rake. As the brand grew, so did the headquarters. In 1987, Cucinelli moved the business to the village where his wife was born, Solomeo. 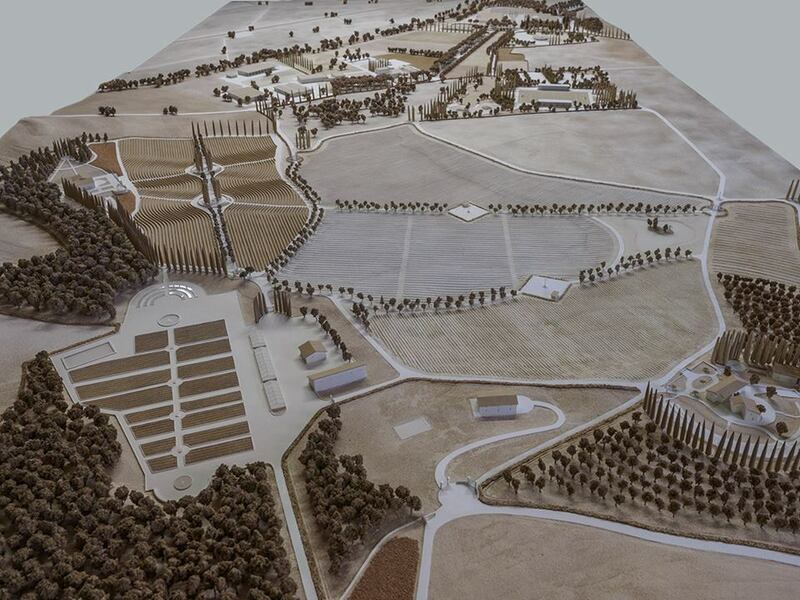 Slowly the company took over responsibility for restoration of the entire town, which today also encompasses a theater, an amphitheater, and the Aurelian Neo-Humanistic Academy, which hosts seminars on philosophy, history, architecture and spirituality. There’s also a vineyard, a library and a school of arts and crafts that teaches masonry, gardening and farming, tailoring, knitting, cutting and sewing, darning and mending. In the tailoring course, students are awarded scholarships of 700 euros ($891) a month. 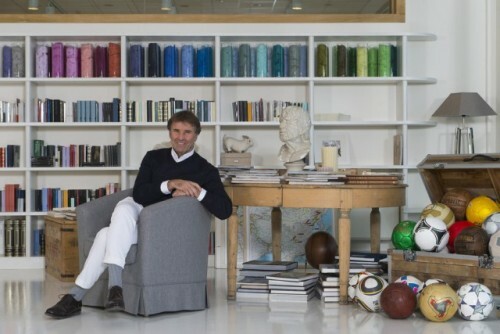 Cucinelli relishes the exchange between students, artists and workers. To ensure the continuity of his company, the unity of the village—as well as for his daughters Camilla and Carolina who both work in product development for the brand—Cucinelli has set up an irreversible trust. In 2010, Cucinelli received the Cavaliere del Lavoro award, Italy’s top business recognition, from the president of Italy. In 2012, the company gave Christmas bonuses of 6,000 euros ($7,513) each to longtime employees to mark the listing of the company on the Italian stock market to thank them for their support and for helping make the IPO possible. His responsibility to the customer? Again to FT.com, “If you buy a sweater for €1,000 and you know that the funds you are paying are also going to help to build a hospital and a school, wouldn’t you think better about it? If I know a product is made well I will buy. I don’t want to buy something that has harmed anyone, this is my absolutely strongest belief, and I believe other people think this too. Or if they don’t now, they will”. There are thirteen Brunello Cucinelli Boutiques in the U.S. 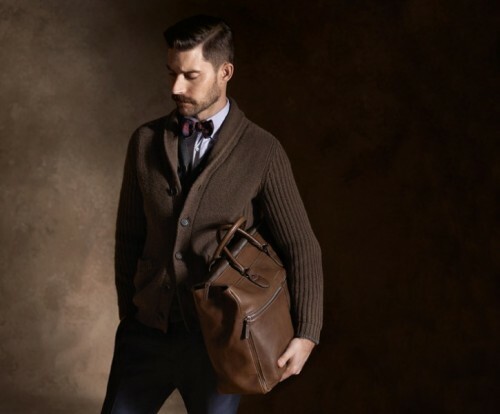 The Brunello Cucinelli website encompasses both fashion and philosophy. 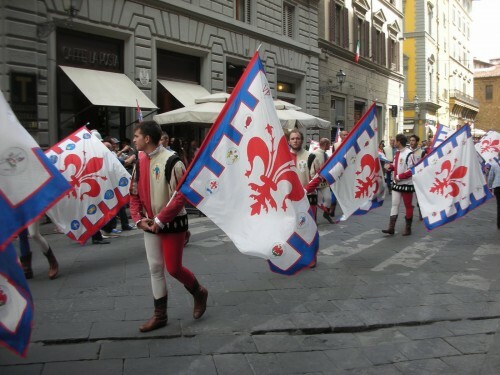 For years I’ve been telling my touring clients at FriendinFlorence.com to listen for the sound of drums and trumpets in the alleys of Florence. “You are sure to see men in tights if you find the corteo,” I say. 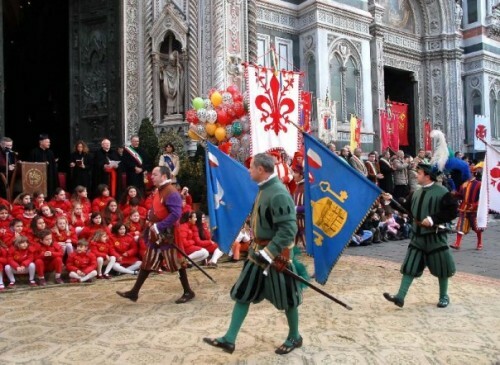 Throughout the year, there are at least thirty parades, processions, or other celebrations with historical costumes, including men in tights. The drummers are in tights, the trumpeters are in tights, the flag wavers are in tights, even the noblemen on horses are in tights as they ride in the corteo. 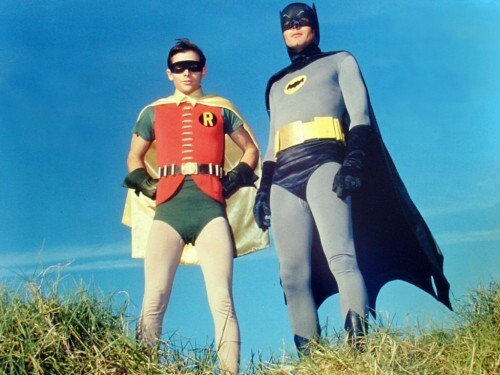 The U.S. has it’s own men in tights but they are usually super heros. 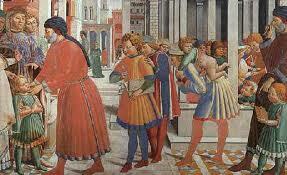 Florence, however, has the longest and most colorful history of men who showed a lot of leg. Frescos celebrate the fashionable men who roamed the streets generation after generation for almost 300 years (14th – 16th centuries). Lorenzo the Magnificent was … yes … magnificent … in tights (something had to distract the focus away from that nose). 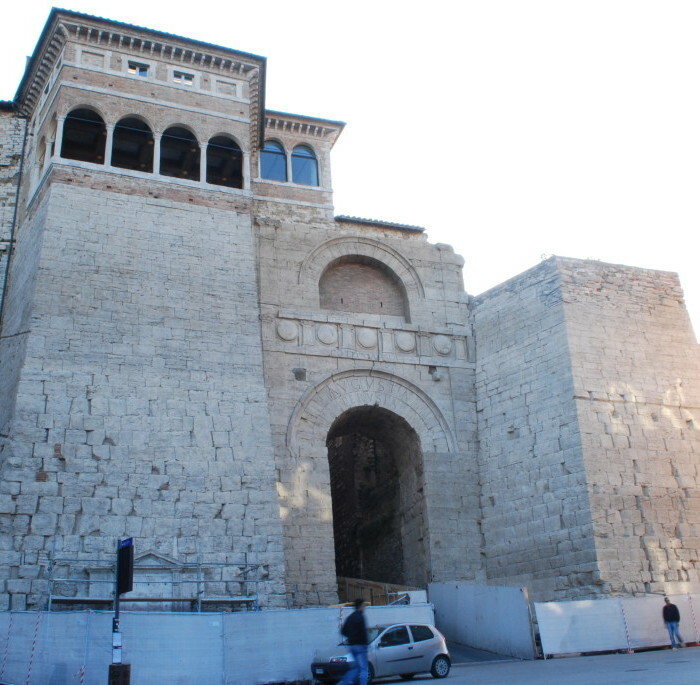 Michelangelo probably didn’t change his calzamaglia more than once a month, if that often. Even Savonarola, the monk of the Bonfire of the Vanities, didn’t disparage the well-turn calf sheathed in skin-tight stockings. 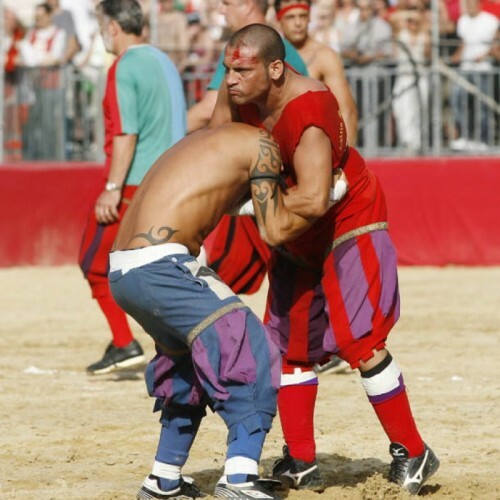 The Calcio Storico in Florence has for centuries shown how manly men in tights can be. Or perhaps it’s because they are wearing stockings and bloomers that makes this annual game so bloody and violent. I hadn’t thought of it that way before. It was, of course, a Tuscan, Emilio Cavallini (born 1945 in San Miniato near Pisa), who introduced unisex hosiery to modern times. In 2009, his high-end stocking company designed products for a more male sensibility and now it sells about 30,000 pairs a year to men. The new billionaire owner of Spanx didn’t skyrocket to success by ignoring the growing male market – look for Spanx this year for men who want to smooth those unsightly thigh-topping saddlebags. Runners have been sporting spandex for years never knowing how fashionable they were (perhaps only worrying about that chaffing problem), but now they can toss away the all black look and add a little creativity with stripes, skulls, plaids and polka dots. 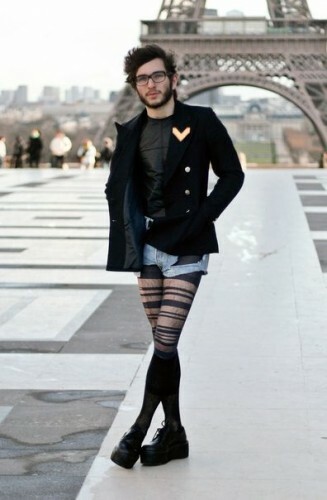 Colorful Mantyhose for Spring 2012? 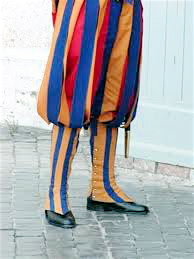 And maybe rainbow colors will show up in the designers’ lines for men next season and we will have come full circle from the trend setter of the Renaissance to the fashion forward man of today.